Green domestic goddess in the making? My ultra random food cravings make it impossible for me to stick to a specific diet. Some days it’s pork belly and other days, cacio e pepe (love love love carbs). The two times that I tried, was only because of my desperate measure to lose weight (the flab glides on once you turn 30 mind you)! In 2014, it was a 5 day juice cleanse (it involved 7am hot yoga every morning too) and in 2015, I went bonkers attempting the terrifying 10-day Mastercleanse (a colon clearing ritual that consisted of sustaining on a very intriguing type of lemonade – lemon juice, maple syrup, cayenne pepper and apple cider vinegar). Only lesson I learnt from those times is balance and moderation. Too much of anything is never any good. Even if it is a super food. Take rice for example. Nutritionists may tell you brown rice trumps white rice but then brown rice is supposedly arsenic too. But before you go back to white rice, you find out it is not any better because it has a high glycemic index (GI) and would increase your risk of diabetes. Don’t even get me started on gluten. ‘Gluten-free’ is suddenly the way to go even if you do not have celiac disease. News flash everyone; a gluten-free diet does not mean you are healthier. You might be saying no to many vitamins, minerals and fibre that are found in the whole grains you’re so busy avoiding. I say this only because I too, went through a brief phase, looking to eliminate gluten in my life. Of course I failed terribly because I love bread too damn much. Food is a way of life, and more than anything else, the focus should be on whether you’re putting nourishing foods into your body. Call it clean eating, or healthy eating if you may, but it simply means preparing more food yourself. And though Daryl and I both have 9 to 5 jobs, we try our very best to cook more. Weekdays are more challenging, therefore we sometimes compensate by cooking more on the weekends. And we have been busy at it! I just made the entire meal vegetarian, in order not to alienate my lovely friends. Appetisers were sweet potato fries (hand-cut mind you), hummus (hand-soaked, hand-peeled, hand-made…. yes my hands were quite involved) and greek bruschetta. Freshly boiled chickpeas is the way to go if you’re looking for that delicious thick creamy texture that’s reminiscent of the traditional Arabic style hummus. Which means, prep starts about a day earlier. The chickpeas have to be soaked overnight before boiling. For extra creaminess, throw in some bicarbonate soda in your soaking water. That allows the skin to separate easily. Hummus is basically a combination of boiled chickpeas, tahini, lemon juice, garlic cloves, ground cumin, sumac, and olive oil. And you salt it to taste. Everything goes into the blender (but not before the ardous task of washing/peeling the skins off!). You don’t really need a recipe with hummus because it’s that easy. But here’s a rough guide of the ratio I used: 500g dry chickpeas, 250g tahnini, juice of 2 lemons, 2 garlic cloves, chopped, a dash of ground cumin and sumac. Add however much olive oil you want. You need it to make the paste wet enough for the blender to whirr smoothly. Psst. The basil in the bruschetta was plucked from our very fragrant basil plant! The main course – Tofu mushroom summer noodles were a hit and you can see how much Tanvi (the lacto-vegetarian) loved it. Dessert was a simple summer berry chocolate chia seed pudding. Five dishes, and four happy friends later, I think I have unlocked a personal achievement. My inner Donna Hay has come out to play. And if you like to join me, drop me an email at thebakerwhocooks@gmail.com because I want to seriously start a supperclub of sorts. No more talking about it. It’s time to put my whisk, ladle, spatula ya-da, ya-da where my pot and pan is! As a person who truly loves food, I find it hard to stick to the typical meal plan that has been dictated over the years. You know what I mean – our mandatory 3 meals. I find it hard to believe that the majority of us follow the same set arrangement. Aren’t our bodies all made differently? Some take longer to digest their food while others get hungry very easily. I’m sure there have been times in between meals where you’ve felt your tummy growling, making funny noises as if screaming for food? I know I have. That’s why we have snacks. And thank God for snacks. When planned well, snacks shouldn’t be that much of a vice, causing unnecesary worry of weight piling. Who says all snacks are unhealthy? As long as you have the smarts to choose the right snacks, you’re pretty safe. Snacking sometimes bring guilt. Come on, you don’t have to be embarrassed. I used to feel bad too. You’re not the only one. Eating between meals is considered greedy and normally reflects ill tolerance. But hey, some people aren’t cut out for the cookie-cutter 3 meal plan! So what snacks should you eat? Well there’s no need to restrict yourself as long as you eat in moderation. If you decide to have a packet of chips, that’s fine, but stop at a couple. There’s no need for you to finish that huge packet. Drink water in between and you’ll feel full soon enough. We tend to sometimes mistake thirst for hunger. If you’re not sure, just gulp down some water. You can never have enough of this wonder liquid. If you’re looking for healthy snacks, you probably want to avoid fried stuff. You can really do without the extra oil. Baked is good, and that’s the way I went with this snack I’m about to introduce. 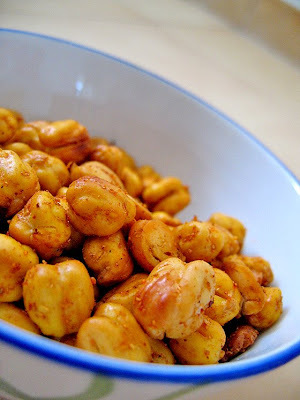 Baked chick peas with a hint of spice. It’s really easy to make. I came across this brillian idea in a women’s magazine some time ago. You can choose to get a can of ready cooked chickpeas (or Garbanzo beans as it is sometimes called) or boil some. After it’s cooked, place it on a flat pan and bake it in the oven until crisp/dry. Careful not to burn it. Once it’s done, drizzle with olive oil and season it with your desired spice. I used a curry-like spice powder I bought from Mustapha the other day. 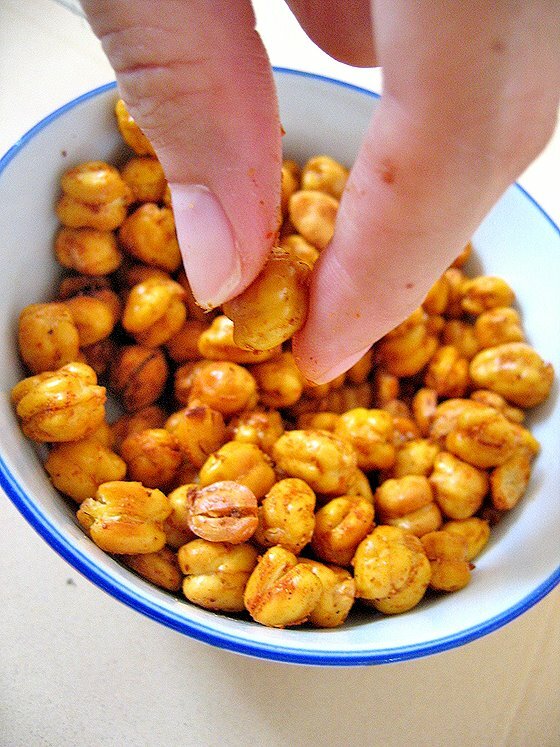 Trust me, these chickpeas are really good. Not only do they taste good, they are high in fibre and vitamins. Go on, snack on some, you don’t have to feel bad! Snacking is not a sin and it can be healthy especially home-made ones! In the mean time, take care and eat well!